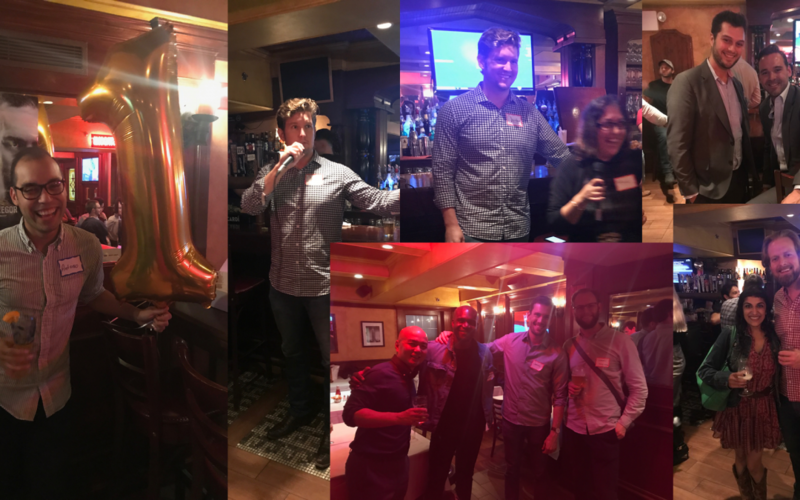 Thank you to everyone who joined us for our 1st Anniversary Happy Hour on October 27th! It was a fun night celebrating a major milestone for our community—right back where it all started with our Kick-Off Happy Hour a year ago! While we don’t really have any formal programming at our happy hours to recap, I did want to take a minute and share with the broader community a message (and call to action) I delivered on the 27th. Thank you. Thank you to our members, to our wonderful event sponsors, to our dynamic speakers/demo presenters, and to everyone who has helped us grow from a small group of friends interested in legal tech gathering for a drink to a family of over 1,000 strong. We’ve laid the foundation for a broad-based, diverse, supportive, and well-organized NYC-based legal technology ecosystem. But this is just the beginning. The pieces (e.g., the people and the resources) that we’ve been able to pull together over the past year have been remarkable. But they’re just that: pieces. It’s time for us to take those pieces and build something meaningful and transformative. We have an amazing opportunity before us. We just need to figure out exactly what to build and how to do it. To that end, in connection with our first anniversary, we’ve launched a strategic-planning effort to, among other things, develop a clear mission and set of values for our community. Once we are able to clearly articulate that mission and those values, we’ll publish them as the lodestar in light of which we’ll expand and enrich our programming to add deeper and broader value to the ecosystem we’re building. In connection with our first anniversary, I also reflected on what we’ll need from our community members in order to execute on the vision we shape. To take the community to the next level, we need you—and all of our members—to do three things: engage, invite, and publicize. What do we mean by engage? First and foremost, tell us what you need. Tell us what you want. If this is going to be the supportive and collaborative community we intend to build, we need to know how to support and collaborate with you. But don’t stop there. Also tell us what YOU can give back to our community. If this is going to be something meaningful and transformative, we can’t simply be passive consumers of information and programming. We need to step and engage with the process. The ask: Each month, step up and let us—your fellow members—know one how we can add value to your lives, and how you can add value to others in return. For this community to be successful, we also need the right people at the table. At over 1,000 members, we no longer need to be focused on raw growth. We need to be focused on smart growth. And to grow in a smart, targeted way, we need your help. The ask: Each month, invite one person whose voice we need in our community to join us at our next event. Finally, we need to get the word out. But we’re not seeking indiscriminate publicity or reshapes of our social media posts. For this community to be successful, we need help telling the story of who we are and what we’re trying to achieve. What’s more, our community is full of incredible people doing amazing work. Supporting that work and the fellow innovators in our community is core to our collective mission. So we also need help telling their stories, too. The ask: Each month, help us tell one story—either about our community broadly or someone amazing in it. It could be as simple as a one-line tweet shining a spotlight on a fellow member or as involved as a blog post or article telling a story at length. (1) Step up and let us—your fellow members—know one how we can add value to your lives, and how you can add value to others in return. (2) Invite one person whose voice we need in our community to join us at our next event. (3) Help us tell one story (as simple as a one-line tweet)—either about our community broadly or someone amazing in it. If we—together—all can take these three simple steps each month, our community will truly begin to soar. Thanks for your help!